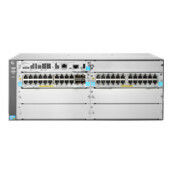 The Aruba 5400R zl2 Switch Series is an industry-leading mobile campus access solution with HP Smart Rate multi-gigabit ports for high-speed connectivity and bandwidth for next wave 802.11ac devices. It brings enterprise-class resiliency and innovative flexibility and scalability to mobile-first networks. Robust virtualization with AllianceOne solutions, hitless failover, QoS, and security with full L3 features and flexible connectivity including 40 Gigabit Ethernet ports and full PoE+, the Aruba 5400R requires no add-on software licensing and is SDN ready with OpenFlow support.